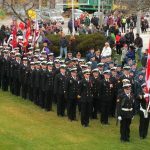 Port Stanley (or just ‘Port’ to its residents) is a community in the Municipality of Central Elgin, Ontario, Elgin County. 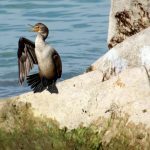 It’s located on the north shore of Lake Erie at the mouth of Kettle Creek. A settlement named Kettle Creek was founded here in 1812 by Lieutenant-Colonel John Bostwick. 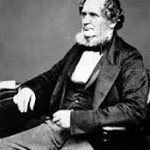 Around 1824, it was re-named Port Stanley after Edward Smith-Stanley, 14th Earl of Derby, who had visited nearby Port Talbot. Lord Stanley later became Prime Minister of the United Kingdom and the father of Frederick Stanley, 16th Earl of Derby, Governor General of Canada, ice hockey enthusiast and donor of the first Stanley Cup in 1893. 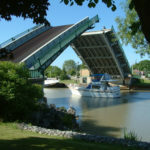 In 1832, a ferry service between Port Stanley and Buffalo was established, and by 1833 Port Stanley had become known to be one of the finest harbors on Lake Erie. The harbor was large and sheltered, operated by Transport Canada. These facilities supported trade in coal and wood between Southwestern Ontario and the United States. Today our harbor is home to a vibrant million dollar commercial fishery, and four marina’s for sport fishing and recreational sailing. 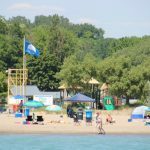 In the early 1900’s, Port Stanley was the main tourist attraction on the lake and was called “The Coney Island of the Great Lakes”. 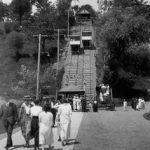 The large sandy beach housed a cafeteria, an incline railway to Picnic Hill (which overlooked the harbor), a casino, The Stork Club (with a public pool), an outdoor theatre, a Ferris wheel and a rollercoaster. 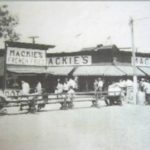 Mackies (a well-known eatery and famous for its orangeade and fries) has been on the beach since it was built in 1911. People came by boat, car, or Terminal Rail (a tourist train that ran between London, St. Thomas and Port Stanley) to hear the big band sounds of Guy Lombardo and others. 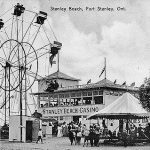 In 1926, Port Stanley opened what was then called the L&PS Pavilion, but was renamed the Stork Club in the early 1950’s. 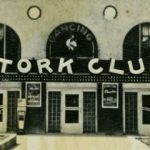 With the largest dance floor in London-Port Stanley area measuring 13,000-square-feet (1,200 m2), the club was famous for swing dance and attracted some of the biggest bands in North America. It briefly closed between 1973 and 1974, but was reopened after massive renovations to bring the building up to code. The last event was a performance by Day Break on New Year’s Eve 1978/79. After that, a dumpster fire damaged the building too heavily to save it. 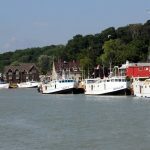 Today, Port Stanley is still known for its large beach but also for its wonderful boutiques, antique shops, railroad, art galleries and theatre. It has a rich history, superb dining, comfortable accommodations and a range of services for its residents and the many guests who visit this beautiful harbor community.